Daimler returns to the new car showroom this autumn with an all-new model, the Super Eight. Daimler owners are making a statement with the car that they drive. They are telling the world what they want and expect from the Daimler marque - a car of quality, beauty and unparalleled craftsmanship: A car like the new Daimler Super Eight. For over a century the mention of the Daimler name or the sight of the unique fluted radiator grille has evoked the memory of a succession of classic automobiles. From the famous Double Six V12-engined Daimlers of the 1920s that were owned by King George V of England, through to the Sovereign and Double Six models of the 1960s and '70s, Britain's oldest and most respected marque has signified luxury, sophisticated style and individual statement. For 109, years Daimlers have been bought by people who expect the best and appreciate the authenticity and craftsmanship that a Daimler can offer. In the 21st century nothing has changed. Owned by Jaguar since 1960, Daimler is proud to start the next chapter in its distinguished history with the unveiling of a new model, a car that reaffirms the marque's valued position in the marketplace and offers the large number of loyal Daimler owners and enthusiasts around the world the opportunity to enjoy a new model that reflects their motoring desires and lifestyles. Daimler returns to the market with this new car following a groundswell of customer demand. Daimler owners expect the best of everything and compromise on nothing, which is the philosophy behind the new Super Eight. From refined performance and comfort through to distinctive but timeless design, the new Daimler will give customers the opportunity to experience the latest in automotive technologies whilst making a discreet but confident statement about themselves. 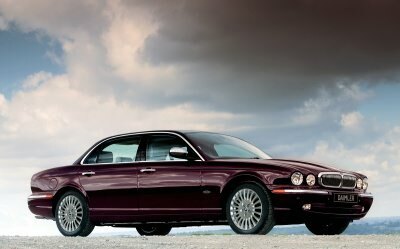 "We know that customers who buy Daimlers - like their Jaguar counterparts - are immensely loyal to the brand. When they come to our showrooms to buy the new Daimler Super Eight; they will not only enjoy driving and being driven in the most advanced Daimler ever, but they will also receive the bespoke and personal service that makes the Daimler ownership experience so special from the very first moment," says Bibiana Boerio, Managing Director, Jaguar Cars. If the Daimler buying experience will lack for nothing, then the driving experience is its equal. The new Daimler Super Eight is powered by a 4.2 litre supercharged V8 engine mounted in an innovative lightweight aluminium body, and the resulting performance gives the Daimler effortless and refined, high-speed cruising ability. 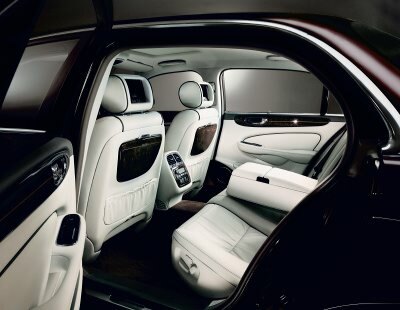 Inside the new Daimler, comfort levels will be sumptuous thanks to luxurious trim of the highest quality and a comprehensive range of equipment including voice-activated four-zone climate control, a full multi-media entertainment system and power adjustable rear-seats with folding work-tables. "The new Daimler Super Eight is a premium product for a premium customer base," says Bibiana Boerio. "But it's also more than that. It quite seamlessly blends the marque's wonderful heritage and image with some incredible technology and design. The great Daimlers of the past now have a successor and our Daimler customers have the opportunity to express themselves once again." 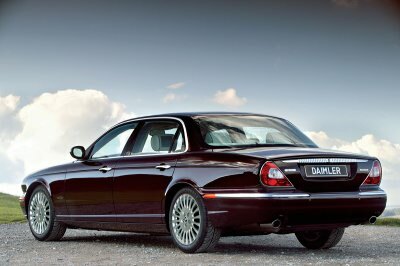 - The new Daimler Super Eight will be on sale from November 2005. THE NEW DAIMLER IN DETAIL "A Daimler owner is overtly aware of the heritage and history of the marque," says Ian Callum, Design Director, Jaguar Cars. "They want a car that reflects that and makes them feel like they are part of our history. Daimler is a distinguished car maker - don't forget that British monarchs and other royal families around the world have driven them for decades - and a modern Daimler should recognise that. "I think the new Daimler does the job perfectly. It's a beautiful, fast and quite dramatic car but also deeply authentic. The level of craftsmanship that has gone into every area is superb. Our woods and leathers are of the highest quality, right down to the beautiful Boxwood inlays that sit in the veneers." It is this level of quality and attention to detail that makes the new Daimler such a unique proposition. THE INTERIOR With the longest wheelbase in the premium F segment, the new Daimler offers rear-seat passengers a level of comfort that matches any executive saloon thanks to its generous interior proportions. With more than 39 inches (999mm) of legroom in the back, rear passengers will enjoy unparalleled space and comfort levels without disrupting the legroom for the driver or front-seat passenger. Additional features such as powered reclining rear seats with four-way lumbar adjustment and the ability to move the front passenger seat forward using controls in the rear cabin mean passengers can create their own ideal comfort levels. Finishing touches such as lambs' wool rugs and head-rests embroidered with the swirling 'D' logo mean this could only be the cabin of a Daimler. Amidst this opulent surrounding there is a great deal of innovative technology, designed to allow passengers to work or relax when the mood takes them. Fold-down business trays stored in the front seat-backs can hold notebook computers powered by a convenient auxiliary socket. Optional display screens in the front seat head-rests (standard in some markets) allow backseat passengers to watch television through the multi-media system that can also connect to iPod and MP3 players, DVD machines and computer game consoles. For the driver, technology and comfort are also on hand in the form of multi-directional powered seats with heating and memory function. The perfect driving position is just the twist of a knob away thanks to a reach and rake adjustable steering wheel and also electrically adjustable pedals. A simple and clear touch-screen control system allows the driver or front-seat passenger to programme the satellite-navigation system, four-zone climate control, telephone and audio system. Quality interior trim is another mark of Daimler and the new model offers its customers three classic choices in the form of soft-grain leathers in Champagne, Ivory or Charcoal. Classic Burr Walnut veneer is the finishing touch, its wood inlay acting as a subtle counterpoint to the elegant polished surfaces. THE EXTERIOR New Daimler owners will have the choice of six exterior colours, including two that are unique to the Daimler palette - Garnet, a metallic burgundy, and Westminster Blue. Other classic Daimler exterior details will include the traditional fluted radiator grille with swirling 'D' badge, 18-inch Rapier alloy wheels and chrome dressing to the wing mirrors and rear-light surrounds. Behind that characteristic grille lies the heart of the new Daimler, a 4.2 litre supercharged V8 engine of proven excellence, that offers owners the ideal blend of technology, refinement and performance. Producing 400bhp (298kW) DIN at 6100rpm and a mighty 408 lb ft (553Nm) DIN of torque at just 3500rpm, the supercharged V8 allows the Daimler to accelerate to 60mph (100kph) in just 5.0 (5.3) seconds and continue on to an electronically limited top speed of 155mph (250kph). These levels of performance could not be achieved without a class-leading six-speed automatic transmission and the use of aluminium for the Daimler's high-tech chassis and body panels. This lightweight material shaves over 200kg from the weight of the car compared to the previous generation Daimler, meaning the new model shows superb balance and handling at higher speeds but tremendous refinement and comfort at all times. Like the models that preceded it, the latest version exhibits true Daimler characteristics - hiding latent power and performance behind a calm and dignified exterior. DAIMLER HERITAGE Now owned by Jaguar Cars, the Daimler Motor Company was formed in 1896 after the German-born British engineer Fredrick Simms had established an earlier agreement to sell Gottlieb Daimler's engine technology in Britain. With funding from motor financier HJ Lawson, the first British-built Daimlers appeared in 1897 and were hugely popular - 89 were sold in the first year of production to customers amazed by a series of endurance trials, including Henry Sturmey's run from John O'Groats to Land's End. Early Daimler owners included John Scott-Montagu, a Member of Parliament and enthusiastic motorist. He was the father of Lord Montagu of Beaulieu who established the National Motor Museum in his memory. When Montagu ran his four-cylinder Daimler in the 1899 Paris-Ostend road race with co-driver Charles Rolls, they became the first British drivers in motoring history to enter one of the famous long-distance races. It was Montagu who introduced Edward, Prince of Wales (later King Edward VII), to the Daimler name in 1900. And in so doing he cemented a relationship with the British royal family that would extend for over a century. The Second World War saw Daimler's attentions diverted by the war effort - between 1939 and 1945 they built nearly 10,000 4x4 Scout Cars and 50,000 Bristol aero engines. But following the conflict attention returned to construction of the DE36, at the time the world's largest production car, so designed because its chassis was the only one capable of supporting the enormous coach built bodies ordered by heads of state. In 1960, Daimler was bought by Jaguar Cars and in nearly half a century since has continued to represent the epitome of luxury British motoring. THE DAIMLER MARKETS Traditionally Daimler has appealed to customers from the United Kingdom and mainland European countries such as Switzerland, Italy, Holland, Belgium and France. However, the burgeoning Far East market is also expected to show considerable interest in the new Daimler. "In the past we've had very great success with previous Daimlers in countries like Switzerland," says Stephen Perrin, Global Marketing Director, Jaguar Cars. "But we also have a large following in countries such as Thailand, Malaysia and Japan. Just as in Great Britain, many royal families and political dignitaries in the Far East have traditionally used Daimlers and we expect this new model to appeal to them in much the same way as the previous generation did. We don't expect to sell thousands of cars annually - but that is not the point of Daimler. We know there is latent demand out there and will sell them on an individual basis to Daimler enthusiasts looking for renowned British engineering and craftsmanship tailored to a name that is as distinguished as our customer base itself."